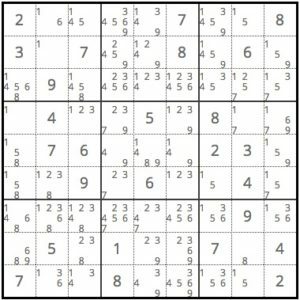 A hidden single occurs on a sudoku board when there is only one cell left in a row, column, or box where a specific number can occur. Sometimes they are very easy to find, and sometimes they are not as obvious. 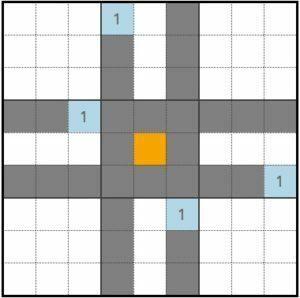 The 1s in the surrounding boxes mean that the only cell in the middle box that can be 1 is the one highlighted in orange. When using pencil marks, you can visually scan through a row, column, or box. When you see that a number only occurs once, that means you have a hidden single. If you look very carefully at the pencil marks in the upper right box, you will see there is a hidden single. 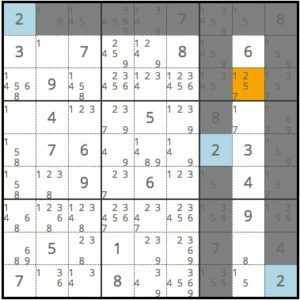 The highlighted cell is the only one in the box that can be the number 2.